Unlike most chapters on the Navajo Nation, Sawmill is built almost entirely out of wood. Something is different about this quiet mountain chapter set in a series of meadows high atop the Defiance Plateau. It takes a minute to figure it out. Then it hits you: While nearly every other community on the Navajo Nation has relied on stone, brick and cinder block to construct its homes, stores and churches, here is a town entirely built out of wood. 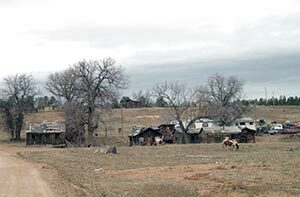 The dilapidated clapboard houses and barns would fit right into one of the Victorian-era mining towns off the reservation. The chapter house is still heated by a voracious hand-welded wood stove. Even the Great Seal of the Navajo Nation hanging on the chapter house wall is carved out of wood. In a metaphorical sense, too, this chapter was built on wood. "There were people living here before the sawmill," says our guide, who must remain nameless since his boss is none too thrilled about this interview, "but the community really coalesced around the mill." The Sawmill native (we'll call him "Kee"), who looks to be in his late 30s or early 40s, remembers when the air above Sawmill hung heavy with dust from the logging roads. But even then, the old mill was closed — the logging trucks were carrying their cargo of pine to Navajo, N.M., where the Navajo Forest Products Industry had built a new mill in 1962. Name — Named after the sawmill that was built here in the 1940s and operated until 1962. The Navajo name Ni'iijíii Hasáni means "Old Sawmill." Famous sons and daughters — Code Talkers Keith Little, Howard Billiman Jr. and Jimmie Begay; Miss Navajos Wena Jesus Nez (1987-8) and Geraldine Morgan Pete (1956-7); former Apache County Superintendent of Education Pauline Begay. Many fine rug weavers hail from the town of White Clay, and several popular Navajo bands got their start in Sawmill. TV journalist Charles Kuralt once passed through Sawmill on one of his "On the Road" episodes. Points of interest — KTNN's radio towers broadcast across one of the most extensive broadcast areas in the country, 32,976 square miles. There have been several reported Bigfoot sightings around Sawmill and a local hunter claims to have a sound recording of the beast.